Heath PadgettHeath Padgett, 23, will work 50 jobs in 50 states. Hourly workers make up almost three-fourths of the US workforce — yet certain stigmas associated with these workers still exist, and they don’t always get the recognition they deserve, says Heath Padgett, a 23-year-old recent college graduate. 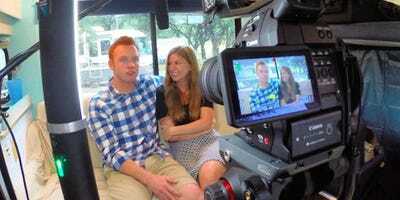 Padgett and Alyssa, his videographer, have found most of the 38 hourly gigs he’s worked through Snagajob.com, America’s largest network for hourly employment. 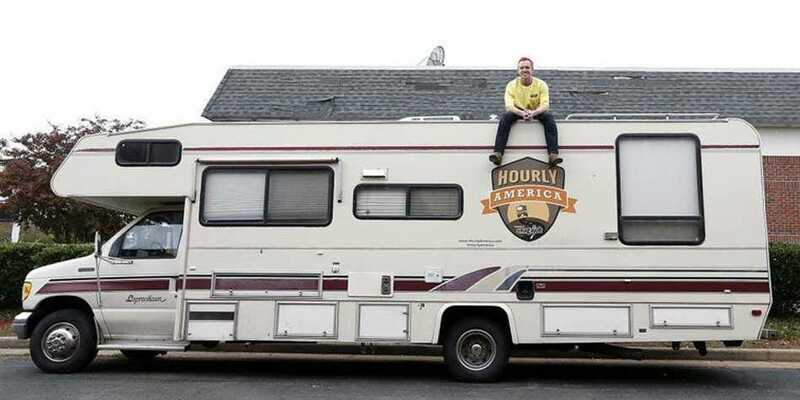 Padgett, who graduated from Concordia University Texas with a major in business and entrepreneurship in 2013, recently spoke to Business Insider about his favourite moments, his biggest challenges, and the best and worst jobs he’s worked throughout his “Hourly America” journey. Business Insider: Can you tell me what inspired you to embark on this “50 jobs in 50 states” journey? Heath Padgett: After college I took a sales job with a software company and quickly realised that I wasn’t built for sitting in an office all day. I wanted to do more meaningful, creative work and figure out what kind of work made me happy. I’ve always had a desire to travel and the idea of pursuing a mission along with travelling intrigued me. I decided to make this more of a quest and work a job in all 50 states so I could learn more about different kinds of work and meet a lot of people along the way. BI: Can you walk us through how this all works? HP: On average I work two to three different jobs per week. I show up and work for one day in each different place. I obviously don’t become a pro at these jobs — I’m more concerned with getting to know my coworkers, interviewing them about their job and their overall philosophy on work. Why do they do what they do? What do they love most about being a bartender, cook, electrician, etc.? 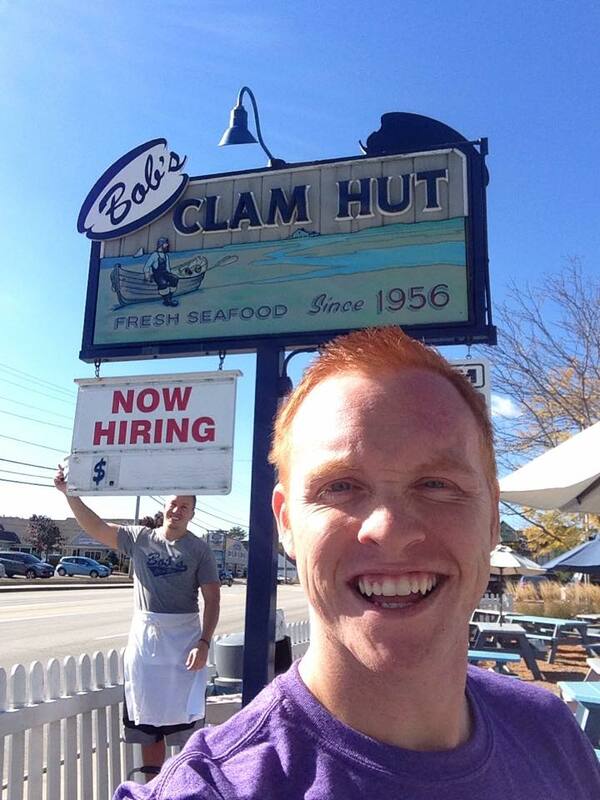 Heath PadgettPadgett in front of Bob’s Clam Hut in Maine, where he worked as a fish fryer. I’ve worked everything from a martial arts assistant to a pizza delivery guy, and even had short stints on a couple different farms. A lot of my jobs have been in the service industry, as I’m particularly interested in learning more about how to fill the void between employees and customers. I want to find more ways for customers to acknowledge and recognise service industry workers outside of purely tipping them. I’ve found most of my jobs through Snagajob.com. I reached out to them before my trip begun with a crazy idea of working a different job in every state, and I asked if they would help me find jobs along the way. They have opened the doors to a lot of the bigger companies for me, where as it might have been a lot more difficult for some random guy to come in for the day. BI: Where are you now, and and how many jobs have you done so far? HP: As of today I’ve worked 38 jobs in 38 states. I’m in Kentucky, and today I worked at a KOA campsite. My wife and I made this trip in our 1994 Coachmen Class C motorhome, and we’ve attracted a lot of attention from fellow RVers who find these 23-year-old newlyweds pretty fascinating. So today we took their advice and spent a day working at a KOA, cleaning bathrooms and all that good stuff. BI: Did you plan ahead of time which jobs you’d have in each state? Or do you figure it out as you go? HP: We fly by the seat of our pants. For instance, I called KOA yesterday along with several other companies. I give them my pitch, tell them why I’m doing what I’m doing, and if they understand or believe in my mission then they let me come in and work for the day alongside their employees. BI: What’s been your favourite job, and why? HP: One of my favourite jobs was working for the Inland Empire 66ers. They are a minor league baseball team in Los Angeles. I spent all day outside working in the bleachers and cleaning the locker room. I played college baseball at Concordia University Texas, and spending a day outside working on a field was the dream. Heath PadgettPadgett working for the Inland Empire 66ers. BI: What’s been the worst, or hardest job, and why? HP: Well two days ago I was “fired” from a job. I wasn’t really fired, but there was a miscommunication between the manager who I spoke with on the phone and the other manager working the day I came in. Apparently, she had no idea I was going to actually work there and wasn’t the kind of person who was flexible to curveballs being thrown at her. Two hours into my shift I received a call from the owner saying that she also didn’t know I was going to be working there that day. They thought I was going to get in the way, and I honestly don’t think they had done any research on our “Hourly America” project, nor did they know our mission. It was a little bit embarrassing having to leave halfway through a shift. But on the other side of things it was a valuable lesson — a lot of people aren’t going to believe in what you’re doing, especially when it breaks the norm. Leaving that job and still having a firm faith in this project to make a difference in the world was affirming to say the least because it showed me how strongly I believe in our mission of sharing stories from everyday workers. Heath PadgettPadgett and his wife/videographer, Alyssa. BI: What’s been the best moment of this experience so far? HP: There have been a few different moments along our trip where someone I’m working with looks at me and just says, “Thank you.” Maybe these are the people who understand that we are here because we want to show the people from the other side of the counter’s point of view. It feels really good to know your mission has inspired someone in some way. BI: What are some of the biggest challenges you’ve faced? HP: Travelling the country in a 20-year-old motorhome in the first year of marriage while working a job in every single state is a huge undertaking. We’ve broken down, had fights when the GPS gets us lost, and experienced so much of the world at a rapid pace. But I would say the biggest challenges are sticking to this project when our RV keeps breaking down. We don’t have a ton of money, and early on, there was no telling if anything positive was going to come from “Hourly America.” Would anyone ever care what we are doing? Does this work matter? It was the internal battle, which was the hardest. I’ve never been a full-time RVer, writer, or filmmaker. All these things are new to me, but going from the unknown to a place of feeling confident in my skills was a huge undertaking. It helps to realise that most people aren’t entirely sure of themselves no matter what it is they are doing, we are all learning. If you meet a person who “has it all together,” then they’re the smartest person I’ve ever met or a really good actor. Life is about practice, not perfection. BI: What has surprised you most? HP: People’s openness. It’s been incredibly easy to find businesses that are willing to let me come in for the day. A lot of businesses have said yes before even taking a look at our website or media coverage. Some places think we are just crazy kids who are trying to do something meaningful with their lives, and they would be right. However, it just proves there are a lot of people out in the world who will accept you if you’re willing to take a few blows in the process. A good friend of mine always says, “Once you open yourself up to the world, the world opens itself up to you.” I now know that statement to be very true. BI: What’s the biggest lesson you’ve learned? HP: Being able to effectively communicate a simple idea is a learned and valuable skill set. It’s one that I am still working on. 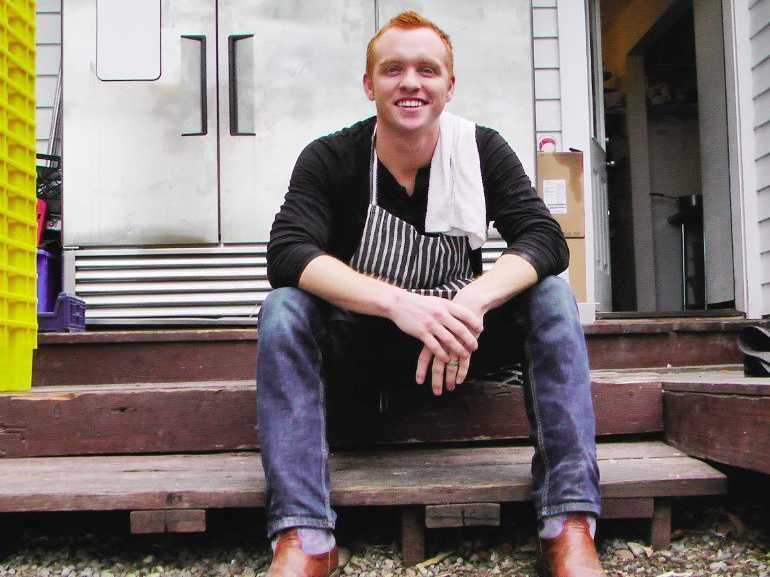 Heath PadgettPadgett, right, working in a kitchen. BI: What do you plan to do when this journey concludes? HP: We will release the film in August 2015, and until then I’m going to be working part time consulting with Jia Jiang, who is an author with an upcoming book launch in April 2015. Jia is a mentor who first gave me the idea to work a different job in every state. He looked me up several months after we talked about it over coffee and realised I had taken his advice and pursued this quest. He then offered me a job because he said that he had received hundreds of inquiries of people asking for guidance, but only a few people had actually taken action from those meetings. I was one of them. BI: Anything else you want to share about your experience? HP: Don’t let people tell you there is a set way to go about your career. I’ve found that the safe and normal way rarely yields the results of stepping outside of the box. I had so many people tell me I was crazy for pursuing this 50-state-50-job quest, however, I’ve had more opportunities open up because of it then I would have ever had if I’d stayed in my office job back in Texas. Heath PadgettPadgett and the RV.